A BREATHTAKING performance from Josh Auty was the highlight, as HEB Scunthorpe Scorpions took a 49-41 victory in the first leg of their cup tie with Edinburgh Monarchs at the Eddie Wright Raceway yesterday (Sunday). Had each race remained as it was out of the first turn, Auty would have scored 3+1. But the Yorkshireman twice raced from last to first (in Heats 6 and 13), to post 13+1, dropping his only point to an opposing rider to Ricky Wells in Heat 1. Meanwhile, Danny Ayres made a highly satisfactory debut for Scorpions, posting a paid 7 score, including a 5-1 with Jason Garrity in Heat 5, after Ayres dived under Justin Sedgmen on the third turn to relieve the Australian of second place. At one point, it appeared that Scunthorpe would have a greater margin to take to Armadale for the second leg on June 14. Scorpions took a 12-point lead after Auty and Stefan Nielsen grabbed a 5-1 in Heat 10, with Auty racing from third to first in that race, and they kept that advantage after a last gap overtake by Jake Allen on Wells in Heat 11. But Monarchs almost took a 5-1 from Heat 12, with a mammoth effort from Garrity taking him past William Lawson on the final bend. Earlier Garrity had suffered an engine failure, just when Heat 3 had looked in the bag. The visitors did take maximum points from Heat 14. 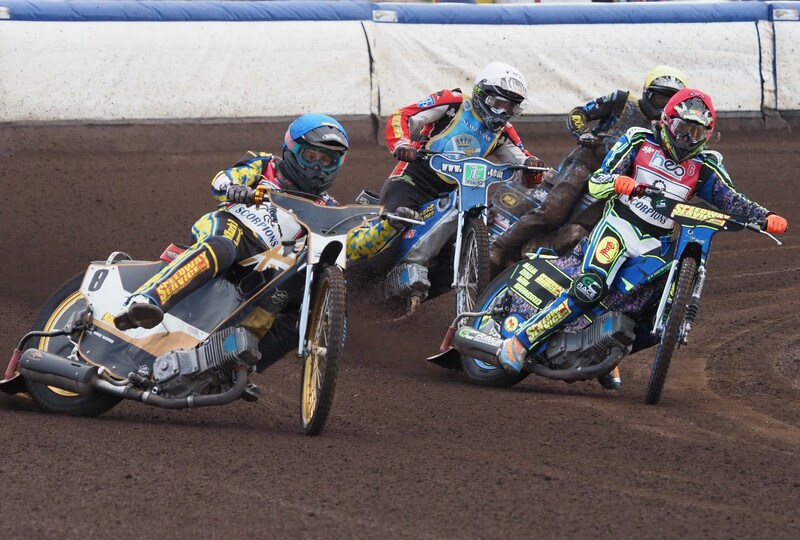 A mad scramble for the minor positions on the final turns saw Ayres and Ryan Kinsley go either side of Lawson on the third bend, only for the experienced Scottish rider to cut back to the inside and pip both Scorpions to the finishing line, as Scunthorpe’s lead was cut to six points. Monarchs were first away in Heat 15, but Auty came steaming through on the opening lap, and then Nielsen charged around Wells and also challenged Cameron Heeps for second place, as Scorpions recorded a 4-2. Scorpions again showed admirable strength-in-depth with each of their seven riders collecting at least one win or paid win. On a bitterly cold early evening, all 15 races were completed within 70 minutes. Stefan Nielsen, who scored 9+1, said: “We were hoping for a 15-to-20-point lead to take to Edinburgh. “But we have to take the positives from it. We do have a lead of 8 points and we’ll be out to defend that when we go up there. “I am pretty pleased with my consistency so far this season: my scores for Scunthorpe have been 7, 8+1, 7+2 and now 9+1. “I also want to go to the away tracks and play my part and I’ve been doing that, so that’s a huge positive. “But I think I can still improve on how I’ve performed around Scunthorpe this season, because I know how well that I can ride this track. “In Heat 15, I had the early momentum to go around the outside of Ricky Wells, but then switched to the inside and tried to pass Cameron Heeps that way. “I did think about trying a big sweep around him, but my brother advised me when Jake (Allen) had tried that in Heat 13, he’d ended up at the back. “I was working on my bike in the pits so didn’t see that race, but that piece of information probably gave me the point, because otherwise I would have tried it and probably been left kicking myself. It just shows how it’s important to have people around who are watching what’s going on. “All-in-all, it’s going OK. We’re winning at home, even if by small margins, and those margins are only going to get bigger as Ryan Kinsley, Josh Bailey and Danny Ayres get dialled into our track – they are already doing well. SCUNTHORPE 49: Josh Auty 13+1, Stefan Nielsen 9+1, Jake Allen 8, Jason Garrity 7, Danny Ayres 5+2 Josh Bailey 5+1, Ryan Kinsley 2+1. EDINBURGH 41: Cameron Heeps 11+1, Josh Pickering 8, Joel Andersson 7+2, Ricky Wells 7, William Lawson 4+1, Justin Sedgmen 4+1, Luke Ruddick 0. * HEB Scunthorpe Scorpions are back in action at the Eddie Wright Raceway on Good Friday (5.30pm) when local rivals Sheffield Tigers are in town in a Championship Shield clash. PHOTO: Josh Bailey and Ryan Kinsley take a 5-1 maximum from Heat 2 (photo: Ian Rispin).